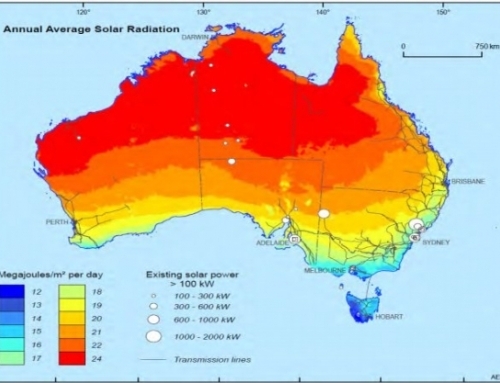 Solar thermal energy turns out to be the key to China meeting its climate commitments. A new study investigates the best combination of renewables for providing the lowest cost to power system operators in two of China’s provinces best suited to scale up renewable energy. China’s power systems operators must invest in renewable energy to meet climate commitments. Wind power and PV are the lowest cost renewables, but they only deliver power when it’s windy or sunny. 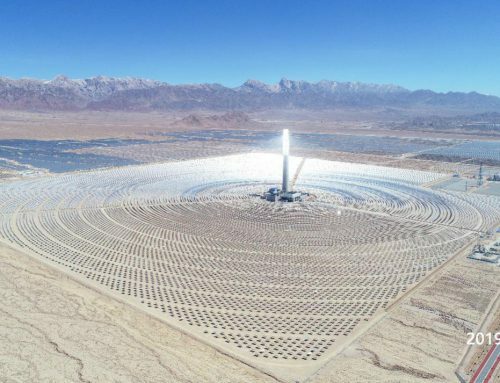 By contrast, more expensive concentrated solar power (CSP), which can store its solar energy relatively inexpensively, and for long durations, can deliver power at any time, day or night. 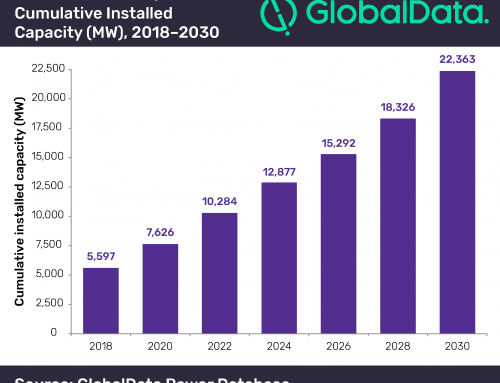 Surprisingly, more expensive CSP could ultimately prove less costly for a power system with a lot of renewable energy because of its flexible dispatch day or night. 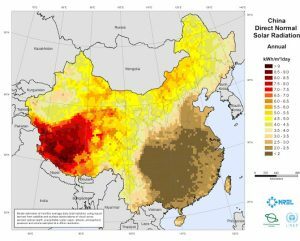 The study finds that if CSP were substituted for between 5 percent and 20 percent of planned PV and wind power in Gansu Province and Qinghai Province it would bring the greatest benefit to power systems operators, reducing curtailment of wind and PV while lowering the operational costs of base load coal generators, that must ramp up and down to ameliorate fluctuating generation from solar and wind. A research team from Beijing’s Tsinghua University report their findings in the July issue of the journal Applied Energy, in Economic justification of concentrating solar power in high renewable energy penetrated power systems. They analyzed the cost-benefit of various levels of CSP in place of planned Variable Renewable Energy (VRE) like PV and wind. 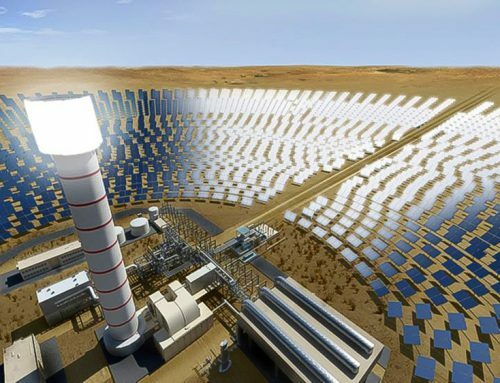 In two provinces in particular, Qinghai and Gansu, which plan to supply 83 percent and 104 percent respectively of their maximum load with VRE, the authors found that substituting CSP for between 5 percent and 20 percent of VRE would result in the lowest cost to the system operator. Qinghai plans to supply 82.3 percent of maximum load demand with a combined 13 GW of VRE; from 3 GW of wind power and 10 GW of PV. Gansu plans to supply 104.3 percent of maximum load demand from a combined 27 GW of VRE; 20 GW of wind and 7 GW of solar PV. The study suggests an additional energy and flexibility benefit of between 18 and 30 cents per kilowatt hour if CSP replaced between 5 percent and up to 20 percent of the proposed solar PV and wind power in these provinces. 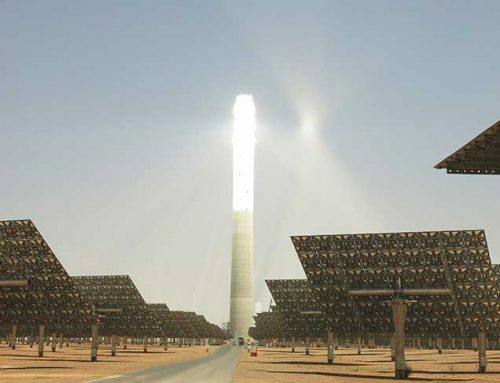 The higher value of CSP’s energy and flexibility benefit justifies its relatively higher investment cost. China’s need for night power is relatively greater than other nations, as factories hum all night in many regions. An entire power system is simulated. Dr. Zhang and Ph.D. candidate Ershun Du at Beijing’s Electrical Engineering department at Tsinghua University helped design the analysis software, using power systems data from the generation and transmission expansion planning and load forecasting data. In Gansu, the benefit value was between 24 and 30 cents per kilowatt hour of generation (0.238–0.300 $/kWh). In Quinghai, with plentiful hydro, the levelized benefit value was under 20 cents (0.177–0.191 $/kWh). “We find that even with a higher initial cost to build CSP, investing in CSP is still economic in both provinces because of its very high external benefit of accommodating wind power and PV that leads to lower cost over time in power system operations,” concluded Zhang. “However, CSP subsidies are still required to internalize the benefit to pay back its heavy investment.